Thanhouser Postcard (R) courtesy Thanhouser Company Film Preservation, Inc.
Thanhouser Career Synopsis: David H. Thompson was an important actor, studio manager, and casting director during the 1911-1915 period. Biographical Notes: Born in New York City on May 4, 1886 (the Photoplay Arts Portfolio of Thanhouser Motion Picture Stars, 1914, states he was born in Liverpool, England on this date), David Harrie Thompson was educated in the public schools of New York City, earning money as a newsboy in his spare time. His advanced education was attained at the City College of New York and Columbia University, after which he pursued various interests, including boxing. He trained several pugilists, including Johnny Burdick, and managed Eddie Walsh. He entered a stage career and, beginning in 1902, spent two years with the Proctor Stock Company, after which engagement he worked with with Amelia Bingham, James J. Corbett, the Kelcey & Shannon company, James K. Hackett, Arnold Daly, Frank J. McIntyre, Blanche Bates and many others. With Thanhouser: One of the relatively few early Thanhouser players with previous film experience, David H. Thompson spent a year with Edison in 1908 (according to the Photoplay Arts Portfolio) or 1910, and also a brief time with Biograph, moving to Thanhouser in 1911, an early role being that of Thomas Jefferson in the Thanhouser production of The Declaration of Independence, released on July 4, 1911. For Thanhouser he served as studio manager, although he acted in several films as well, and directed at least one, The Last Concert. 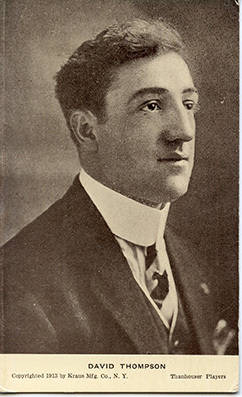 The April 3, 1912 issue of The New York Dramatic Mirror told of his intended change from studio manager to full-time actor: "David H. Thompson has resigned as studio manager of the Thanhouser Company, and on June 15 will sail with his daughter Madeline for London to tour the Continent. They will return to America in the late summer, sailing from Queenstown on August 13, after which Mr. Thompson will join the Thanhouser stock." His daughter, Madeline, was an actress with Thanhouser. They sailed on the Lusitania, and Mrs. Thompson's brothers, James and Philip Brady, who were also associated with Thanhouser, went with them. The New York Dramatic Mirror, September 4, 1912, told of his impending return to America: "David Thompson writes from Home Farm, Killarney, Ireland, that he and Mrs. Thompson and their baby daughter Madeline will sail Sunday, August 10, on the Mauritania 'for the good old U.S.A., after a delightful trip through England, Ireland and Wales and a visit to Paris. Mr. Thompson continues: 'I spent a most delightful time with Sid Olcott and the Kalem company here in Killarney and had the pleasure of playing the stuttering sergeant in The Kerry Gow for the Kalem company. I certainly enjoyed hearing of the nice time they had in Egypt. I met Gerald Griffin in London and he was surprised to meet me.' Mr. Thompson looks forward with pleasure to rejoining his friends of the Edison and Thanhouser studios." In March 1913 he took a leave of absence to attend to his new duties as father of Denman Charles Thompson, who was named after Denman Thompson of The Old Homestead play fame, and to devote time to the New Rochelle Elks' Lodge, of which he was the Grand Exalted Ruler. Tragedy struck, and his child died at the age of nine days. At the time, the Thompsons lived in New Rochelle at 130 North Avenue. The Moving Picture News, January 17, 1914, told of Thompson's frenetic activities: "Dave Thompson, the veteran Thanhouser player, is nothing if not a busy man. Recently he was appointed studio manager of the Thanhouser plant - by the way, he was Thanhouser's first studio manager, to go back into ancient history - but he said that he wanted to go on acting. Mr. Hite, though, knew Thompson had fit himself for the post by previous experience. You see, after being the pioneer studio boss at New Rochelle, Thompson quit the job to take his family to Europe. Returning to the Thanhouser employ, he became a leading man. But President Hite, knowing the Thompson worth, arranged that he take over the managing work and play in the pictures besides. So now Dave gets all the stages in order mornings for all the Thanhouser directors, places the right people with the right producer, 'makes-up' and jumps into a 'lead' himself, finishes, washes up, orders the various stages and sets dismantled, orders used costumes returned and new ones produced, writes up the new property lists, tells the scenic artists the new 'drops' he wants painted and calls the people for the next day! Upon the finish of which Mr. Thompson has 'nothing to do until tomorrow' - provided some delayed director isn't using the studio at night!" 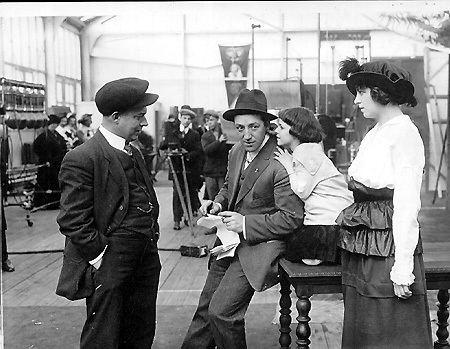 In August 1914 Thompson turned over the cast directorship at the Thanhouser studio to Frank Grimmer so that Thompson could return to his first love, acting. The New Rochelle Pioneer, August 29, 1914, told of the situation: "Dave Thompson [has] a chance to get back on the screen again, and its hard finding Dave now. One day you'll locate him and he's an English lord and the next day he's a toiler in ditches. 'This is the life,' sings Dave." In 1914, when he was with Thanhouser, the Photoplay Arts Portfolio noted: "While he has written scenarios, yet his greatest ambition is to become a director. And while he is not obtrusive with his ideas, yet he feels competent to suggest improvements in motion pictures. His recreation is boxing, so it is only natural for him to say that his principal diversion is to see a 'good fight.'" Reel Life, September 19, 1914, carried this item: "The Thanhouser Company announces that David H. Thompson, the popular 'Dave' of the Big Stage for the past year, has returned to character and heavy leads in pictures. He was unable longer to endure his exile. Mr. Thompson, because of his good judgment and knowledge of the business, was selected a twelvemonth ago to handle the extras in rehearsals, which kept him out of the films himself. But he was clever enough to tutor Frank Grimmer meanwhile, who now steps into the shoes Thompson only too gladly sheds. Everybody familiar with his work in Aurora Floyd and many other Thanhouser productions in which he has won distinction, will be delighted to see their old favorite once more on the screen." David H. Thompson remained with Thanhouser in New Rochelle through the autumn 1914, although his tenure there had many interruptions. A 1914 Sketch: The New Rochelle Pioneer, October 24, 1914, published this sketch by John William Kellette: "Dave Thompson gave my conscience a jolt when I started to write this by putting me wise to the fact that he was born in New York City. My fingers were itching to nail Tuckahoe for the honor, but as Dave claims that he was 'organized and established' on May 4, 1886, in the 'City of Gunmen,' we'll take his word for it. Don't hold it against him though, because if Dave had his choice he would have picked someplace as lively as Larchmont or Mamaroneck. After acquiring the educational opportunities the 'big town' offered, Dave started with the American News Company, devoting his spare moments at night to figuring when he'd be elected a director in the City National Bank, but someone knocked his props from under him and he drifted into the electrical business. As this is a veracious history of the 'Thompson glide,' it might be well to mention that as an 'electrocutor' Dave was a failure. He learned, however, that he was a live wire, and as all live wires, sooner or later, drift to the theatrical field, Dave was no exception. He didn't drift, however, he sailed in, and landed his barque with the old Proctor Stock Company, remaining for four years. Hitting the road for a few years gave Dave an idea that 'seeing America' wasn't what it was cracked up to be, and in 1908 he fell for the 'movies,' going to the Edison Company. He stayed there two years and came to Thanhouser. He's there yet, that boy is! "There's no use in telling you all the good things Dave has accomplished in New Rochelle. If you've been here more than 18 minutes you've heard of Dave. If you're an Elk, you've seen him. He loves his lodge more than a sweet young chicken loves the first time she sees a matinee hero, and that's going some. Dave is way up in Elkdom and has served the New Rochelle lodge honestly and intelligently for several years and his efforts have been appreciated. He knows the picture game from the ground up. He's been climbing upward from the days of the old Thanhouser plant. He's been stage manager, studio director, cast director, actor, 'villain,' juvenile lead, gentlemanly heavy, character lead and finally director of the feature The Last Concert, in which he showed exceptional producing ability. He lives with his wife and daughter on Stephenson Boulevard." Later Years: The New Rochelle Pioneer, December 26, 1914, printed this item: "David H. Thompson, member for the past four years of the Thanhouser Film Corporation, in which connection he held the posts of cast director, an actor, director and studio manager, will sever his connections with that studio next Saturday [January 2, 1915] to assume duties with the Box Office Attraction Company in New York City the following Monday. As Dave is one of the most popular individuals who ever invaded this city, it has been a source of pleasure to his countless friends to know that he will still maintain his residence at 12 Stephenson Boulevard and join the 'Commuter's Club.'" Thanhouser drew him back, and The New Rochelle Pioneer, March 6, 1915, told why he left in the first place, and why he returned: "Dave Thompson is back to his first love - Thanhouser - after having worked for a time with the Box Office Attractions in New York. Asked if he didn't think a certain picture the company was doing to be the biggest thing in the world, with The Million Dollar Mystery in mind, David promptly said NO! in capital letters, just like that. The boss got sore, and Dave got all heated up. Friction was the result and Dave believed his path would be rosier where he could stick to the truth and not get in wrong." However, he didn't remain back at Thanhouser for long, as The New Rochelle Pioneer, May 22, 1915, informed readers: "Dave Thompson has charge of the World Film Studio at Fort Lee. Some considerable honor for David, true, but Dave has intelligence enough to handle any job in the infant industry from writing the scenario to directing the picture." The New Rochelle Pioneer, July 15, 1916, told of still another move: "Mr. Thompson, popularly known as Dave, William Nigh's assistant director in the production of Metro-Columbia photodramas is a seventh son, but not of a seventh son. He makes no claims as to knowledge of the future...."
Thompson became an actor and director for Rolfe-Metro. He acted in the Metro release of The Sunbeam, The Stolen Triumph, and Sowers and Reapers, among others. New Rochelle city directories indicate that in 1911 and 1912 he lived at 99 Brookside Place. By 1913 he moved to 130 North Avenue. From 1914 through 1917 he lived at 12 Stephenson Boulevard. The June 23, 1917 issue of the New Rochelle Pioneer noted that he was one of New Rochelle's most popular citizens and had been named as Grand Exalted Ruler of the local Elks' lodge two years earlier. It was stated that Thompson "has been for many years floor manager of the Metro Studio at 3 West 61st Street (New York City).... Big plans involving the shifting of directors and players and various other changes in the Quality and West 61st Street studios were made during the past week by the Metro Pictures Corporation. The first of the special productions deluxe to be released by Metro will be a picturization of A Sleepy Memory, E. Phillips Oppenheim's popular novel which has been adapted for the screen by Albert Shelby LeVino. Emily Stevens will be the star in this special release, and her leading man will be Frank Mills. A Sleepy Memory will be photographed at the Quality studio, which will henceforth be given to the making of special Metro plays under the general supervision of Maxwell Karger.... Assisting Mr. Karger in the Quality studio will be Dave Thompson...."
A 1916 directory noted that he was 5'11" tall, weighed 184 pounds, and had brown hair and brown eyes. He enjoyed athletics as a recreation, and at the time still lived in New Rochelle, although the Rolfe studio was located in New York City (at 3 West 61st Street). In 1919 he moved to the Hollywood area, where he acted in and later directed films. During the 1920s he was production manager for First National Pictures. In 1930 he founded his own business, the David H. Thompson Agency. David H. Thompson died in Hollywood on May 20, 1957. He was survived by two sons, Lionel and David, Jr. (the latter born on March 8, 1915), who were partners with him in the David H. Thompson Agency, and two daughters.